Behind the Bit: Big name dressage clinicians: Is it as we fear? 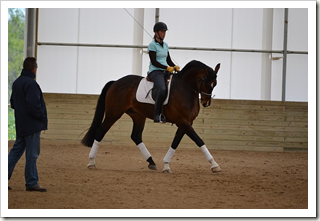 Big name dressage clinicians: Is it as we fear? A few weeks ago, Catherine Haddad wrote a blog post for the Chronicle of the Horse -- It's time to train the trainers. While it's hard to argue her main point about the need for trainers to understand and know the best way to train people to advance in dressage. Well, fine. For some reason, though, Haddad chose to give her personal views and feelings on teaching beginners in her clinics. She certainly let her hair down! She's not too keen on teaching people early in their dressage journey. One memorable statement was that she feels it's "disrespectful" to the clinician (her, I think). The first time I entered a clinic, I was afraid that the trainer would be dismissive. I was green as grass and wondered if I belonged there, so I asked my trainer to check with her before entering me. The clinician took time at the beginning of my ride to tell me that she loves working with beginners and more specifically, training level horses. "If you don't get the foundation right, nothing beyond that will work." I had a wonderful ride. Maybe this was just a way to bump up attendance and line her pockets, and underneath it all this clinician was contemptful. If so, I'm thankful she hid it so well. I want to tell those clinicians who are willing to work with novices -- thank you! I won't be clinic-ing with Catherine Haddad, and hope that other trainers who feel the same will just come out and say it. Let's don't waste each others' time. I guess honesty is good in that situation! Might as well know before spending your time and money. Well written. It is very telling when someone of Ms. Haddad's self-conceived "stature" in dressage decides s/he doesn't wish to work with those who are where THEY were years ago. I didn't care much for Ms. Haddad's blog entry, though she did make good points about learning to progress. Bottom line: The fact that she thinks a beginner is showing "disrespect" by asking to ride with her left me with a bad taste. I'll never ride with her just because of proximity, but if she were coming to a dressage court near me, I wouldn't waste my time to audit her, either. I have been supriced a couple of times now that the big fameous trainers (Arthur Kottas Heldenberg for one) holding the clinic where it has been advertised that they only want higher-class-riders actually askes me in the audience (it's often very few in the audience) why I didn't ride instead. When I ansered that I'm a lower level rider mostly stumbling around they have said that that isn't a problem and they would be happy to have more pupils regardless of my level of training. At one time I didn't even have a horse to ride and one trainer said that that shouldn't be a problem, just take the old pony in the back of the yard, a rider always learns something on every horse. I thought it was really nice that I was welcome regardles of my own skills as a rider or that I didn't need a fancy well trained horse! This is the response I posted when Denny Emerson touched on this article on his facebook page. I will add that I think it would be far more emarassing and uncomfortable for the person riding in the clinic unknowing to the fact that she thinks they are imbeciles than it is for her to "deal" with them. I would venture to guess that if the clinic was marketed as an advanced level clinic that would solve most of the problems. If Catherine wants to only work with the top level then there is nothing wrong with that. It sounds like a communication failure on her part or poor planning on the clinic organizers part. I am not sure in dressage how easy it is to get full clinics but I know in eventing it can at times be tough to fill enough spots to pay for the costs alone. And again guessing here but I doubt Catherine is the cheapest clinician out there. So what is an organizer to do if they can't fill a clinic with just the cream of the crop? I'd be tempted to fill it with anyone willing to hand over the cash. I think in her mind she is trying to say the trainers need to teach better, expect more and produce better students but it comes across more as a, bash on the beginner, article. I know from just having a few students that students are only as good as they work to be. You can't force someone to be better then they want to be. I was turned off of Catherine by this article but she is entitled to her view point. Though I think she is taking multiple problems and generalizing them to put the blame on one group of people when in reality it is a combination of several people in thousands of different circumstances. I think she may be a bit too "high up there" that she has lost touch with the reality of most of the rest of us living in the real world. I saw that article and was really surprised. While I see her point in some ways, I also believe that if a lower level rider is willing to shell out that kind of money to get a clinic from her, she should appreciate the compliment. I agree with Amy, post the clinic for a certain level to avoid having to teach levels you do not want. I have unfortunately paid a high price for a clinic with a big name and been sorely disappointed in the quality of instruction given. That experience and Catherine's article will make me less willing to spend the money without researching the clinician closely. Two left socks, I totally agree! I would not be offended if someone told me that they only teach second level and up, etc. I would be grateful, and I would not be offended. I have seen Michael Poulin teach a rank beginner on an upper level horse, and after a few minutes of watching total miscommunication between horse and rider, flying changes everywhere as the rider shifted inadverdently and the horse gamely tried to figure her out. MP watched for a few minutes and without negativity or fanfare, he called her back to the middle of the ring. He deftly changed his game plan in a way I would never have expected. He removed her stirrups. She sat better, they worked on lower level movements, we all got a lot out of watching, and it was a total win-win. I so appreciate that kind of clinician. I've seen clinicians re-frame to accommodate riders who weren't quite ready for what the trainer had to offer - graciously and not so graciously. If they only want upper level riders they need to make that clear up front. If they accept the money, imo, they need to provide the service they were paid to provide. I will never get that students are supposed to revere the trainer/clinician no matter what. They're the hired help, after all. Pay them, show up on time in appropriate riding gear and tack with a sound, clean horse, ride your best and try to get what you can from the lesson. Respect goes both ways. Yep, it goes along with the idea of "train with me and only me" or some notion of loyalty beyond what you would give a physician, banker, or lawyer. Second opinions are encouraged! I'm sure it stems from relying on the whims of clients for their income, but it just isn't "real world" imho. I want to be courteous to my trainers, to work with them, but it goes both ways. It seems she really offended a lot of people with that article. Respect goes both ways. If you don't have respect for the grass roots of your sport, how do you ever expect anyone to reach greatness? I lost any respect I had for her through that article. We all started out somewhere and sometimes when people advance they seem to forget that. I can see both sides of the argument though as several people have pointed out. Honesty up front is the key factor though. And if you can't fill the slots for the clinic- making the money you wanted to bring in- then ride a horse of your own or horses of the students and demonstrate for the rest of us, what makes you so wonderful. I can also appreciate not wanting to be bothered with those who are there simply because they could be, while they don't really want to be or will do anything with what they have learned. Someone else who has not been as financially fortunate, who may actually be more gifted a rider, talented and WANTS IT would be better suited for the clinic slot even though they haven't the horse or the means to fund it all. Great post! As a lower level rider I, too have run into both kinds of trainer: those willing to work with beginners, and those who won't. I've ridden in clinics with Peggy Klump (former CDS president and wonderfully professional) and Christian Schacht (German trainer and also wonderfully professional). It's always a bit scary to sign up for a clinic as it's not always clear who the clinic is designed for. I've learn to ask very specifically if the trainer is happy to work with Training Level/First Level riders and horses. So far, I've only had lessons with one "big name" trainer who looked down her nose at me. No biggie; I just never went back her! I didn't like the tone of CH's article. I have brought my horse along without the help of regular instruction; I rely on clinics. I have been fortunate to work with one accomplished grand prix trainer one weekend a month. When I first arrived in his clinics as a barely first level horse and rider team, he put us to work and gave me great exercises and tools. I also ride with a former olympian about once a year. I always have a breakthrough so monumental that it is worth the great expense to ride with him. Both trainers are candid about the challenges I have as a rider and that my horse faces with his gaits, but they are always positive and accepting of the challenge. Thank God there are those that are willing to work with the amateurs and lower level riders. From a teaching standpoint, I understand a preference in level, but I don't understand the need for a belittling tone in the article. The author seems to be criticizing most (all) US trainers for not teaching the basics, for example the seat. While I do not completely disagree with her, by turning these underprivileged students away she is perpetuating the problem and dooming them to forever plateau. What dedicated rider brave enough to enter and pay for a clinic with a worldclass trainer wants to receive that message? This author wrote a saddle design article one time that was equally strange in its assertions. Maybe she should stick to training riders on the longe line. I audited Catherine at her clinic in North Carolina this summer as well as last summer. She has spent a very long time in Germany and the brutish upfront way she has about her (especially regarding riding) is not something that Americans swallow easily. She told a clinic rider struggling with lead changes that the fault was not her own but the result of a poorly suited horse. She wasn't being mean, she was being honest. That's not uncommon in Germany. Since the post was written right after the North Carolina clinic I wouldn't be surprised if she was referencing some of the riders there. One showed up on a horse that had been shown the two previous days (and was exhausted because of it) and another on a horse that had been injured and only in work for two weeks. It was ridiculous. What can you say or teach to someone on an exhausted horse? What can a rider hope to improve on a recovering horse (other than walk improvement)? Several other riders were very talented and rode a mixed bag of horses, including one Thoroughbred. I don't think her post was at all mean or rude. I think it was honest and American riders need that.